18kt Gold "Cloche" Wristwatch, Cartier, the guilloche dial with Roman numeral indicators, enclosing manual-wind movement, no. 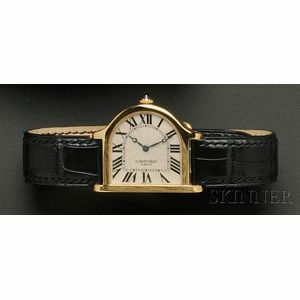 069/100, 2841, black leather strap with 18kt gold deployant clasp, signed case, dial, strap, and buckle. Watch is running and setting, strap and buckle appear original, very gently used condition.